Debates on vegetarian diet have increased in recent years and many analysts are coming forward to defend it as healthy diet over non vegetarian food. While everyone has a right to choose food s/he likes, some brahminical fanatics are forcing people to stop eating the food containing non- vegetarian diet. It may be worthwhile to think of the causes behind such forced diktats. A nationwide survey conducted by the Office of Registrar General & Census Commissioner reveals the actual position. According to the sample registration system (SRS) baseline 2014 released by registrar general of India, 71 percent persons over the age of 15 are non – vegetarians. ( Adrija Bose, updated 15/ 7/ 2016, huffingtonpost.com). While Telangana tops the list of non-veg, Rajasthan has higher percent of vegetarians in the country . According to vegetarianism by country published in en.mwikipedia.com, there are about 1.45 billion people of necessity and another 75 million of choice as vegetarian diet (2010 study). They make about 21.8% of world population. In 2007, UN FAO estimated that Indians had lowest rate of meat consumption in the world. In a 2018 study from Economic and Political Weekly,a US based anthropoligist Balmutali Natarajan and India based economist Suraj Jacob suggested that the percentage of vegetarians in India may be closer to 20% . It argues that meat eating behaviour is under- reported as meat, specially beef, is caught in cultural political and group identity struggles in India. Officially, brahmins, lingayats, jains and vaishnav community are vegetarians though in states like West Bengal, Odisha , etc they eat non- vegetarian food. According to an analysis ( Sreeraj TK, scoopwoop.com) a 2014 survey found that 71.6% males and 70.7% females are non vegetarian. In general category, 69.7% males and 68.8% females are non- veg while in SCs,77.9% males and 76.1% females eat meat. Similarly in STs, 76% males and 75.9% are non- veg. So, about two thirds of people eat meat in the country. One of the reasons may be ‘ imposition ‘ of north culture because there are more people following vegetarian diet in North. The state of Rajasthan leads the list with 73.2% males and 76.6% females followed by Haryana, Punjab, Gujarat and Madhya Pradesh. Most number of non- vegetarians are found in South India and West Bengal. Another most important reason is, obviously, caste. The higher the caste, the more prevalent is vegetarianism. In India, vegetarianism does not include vegans ( who do not eat animal products). Higher castes generally depend on milk as routine diet which is included in vegetarian diet. The lower castes are entrusted with supply of milk by maintaining cattle. As Suryakant Waghmore analyses ( In charts: Vegetarianism in India has more to do with caste hierarchy than love for animals, published Apr 06, 2017,www.scroll.in) the deep rooted caste system in relation to vegetarian diet. ” … The idea of purity attached with vegetarian food tells us about the ideology of caste and its influence on food preferences in India. ” The article states that higher status attached to purity is not rigidly limited to brahmins though. Such an assumption would only put dynamism of caste practice and morals in poor light. It is through change in dietary habits and rituals that make upward mobility of lower castes or non- brahmins is possible. This is what MN Srivas calls the process of Sanskritisation where a caste or sub- caste ( non- brahmins) follows strictly marriage rules, food habits, rituals and scriptures in the hope of attaining higher social status. In a country with majority being non- veg, why vegetarian food is being promoted? One of the reasons may be the political power control. Brahmins and their allied castes have always held control on the country in one form or the other. Even if the persons at the highest office are non- brahmins, they follow and propagate ideas of brahminism including purity of soul and vegetarian diet. Almost all political parties have promoted vegetarian food according to their needs. In states where non- vegetarian people are in majority, even BJP – the party in power- did not ban beef ( like in Goa and Assam). Vegetarianism has become a tool to build a greater Hindu identity. Therefore, if lower castes abstain from meat, especially beef, they can be ‘ brahminised’ easily and co- opted into hindu fold. Instead of forcing others to abstain from eating non- vegetarian food, stress should be laid on healthy, nutritious protein rich food. The lower castes, especially dalits and muslims are engaged in hard labor which require much energy than those of upper castes, especially brahmins. They require proteins, fats and vitamins with high calories so that they can work without exhaustion and be healthy. Brahmins are less than 5% and non- vegetarian brahmins are about 50%. But, the brahminical food habits of vegetarian diet are being profusely and constantly propagated. 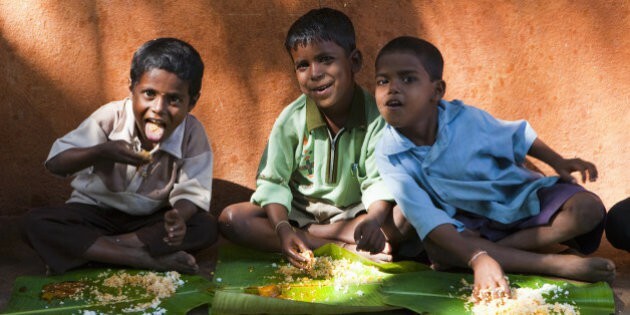 In an article, Nimisha Jaiswal observes (Globalpost, September 4, 2016, www.pri.org) ” ….many of India’s poor majority suffer from malnutrition that meat and animal products would combat. The average Indian simply cannot afford to eat more than the half- ounce of meat per day they currently consume. ” . According to Veena Shatrughna, the former deputy director of National Institute of Nutrition, bureaucrats enamored with vegetarianism have promoted it as policy. The agriculture has invested in wheat and rice instead of meat and poultry , making it more difficult for the poor to access to high quality protein and vitamins. The OECD and FAO in 2015 calculated that every American consumed on an average 210 pounds of meat , each Indian consumed 6.4 pounds. Even Chinese had 110 pounds per person. Therefore, importance of healthy food should be above vegetarian – non-vegetarian binaries. Balance diet with right mix of rich food – both vegetarian and non – vegetarian – will go a long way in helping poor overcome undernourishment, stunting, loss of weight, anemia, etc. Hence, good food should be accessible to all. Check out these writings. I first became aware of them in 1973. In addition, stay away from GMO’s and foods with low nutritional value. … Especially “Recipes for a Small Planet” seems as salient as ever. Diet for a Small Planet is a 1971 bestselling book by Frances Moore Lappé, the first major book … combinations and was followed by a collection, Recipes for a Small Planet by Ellen Buchman Ewald, with an introduction written by Lappé.